Sit back and relax in The Clockmill Residence. Sleeping up to six guests, this lovely two-bedroom apartment has free parking, main door access and is located less than one mile from Edinburgh’s famous medieval Old Town. The open plan living area and kitchen is light and airy, and benefits from ample seating, a large dining table and flat screen TV. The modern kitchen is well equipped with everything you need for an easy self-catering break, including microwave, dishwasher and washing machine. 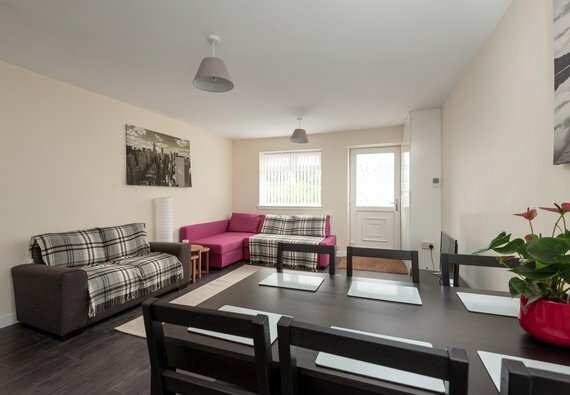 Two double bedrooms, one with en suite, ensure a peaceful night’s sleep, and a 5/6th guest can be accommodated on the comfortable sofa bed in the living room. A large shower room completes this delightful home from home, as well as one allocated parking space. Thanks to The Clockmill Residence’s unique location guests can enjoy being right in the city centre, whilst being tucked away on a quiet street away from the noise, hustle and bustle. Holyrood Park and Arthur’s Seat are just around the corner behind the property, and The Queen is practically your neighbour as HRH’s Scottish residence the Palace of Holyroodhouse is a ten-minute walk away. The Royal Mile and Old Town are under one mile away, and Edinburgh Castle is 1.5 miles. There is a large Sainsbury’s across the road at Meadowbank retail park for grocery shopping. Sleeping arrangements 2 double bedrooms, one sofa bed in the lounge. Accessibility statement This property is on the ground floor. No reviews yet for The Clockmill Residence.